Herbaceous, short-lived perennial forage legume with fine-stemmed semi-erect, indeterminate growth habit. It has no stolons or rhizomes. Used for pasture or hay in mixtures with other legumes and cool-season grasses in humid regions with mild winters. Behaves as an annual or biennial at higher elevation and colder winter climate zones. Can also be used for soil improvement in wet, acid soil conditions. Inflorescence is an almost spherical axillary raceme about 0.75-1.4 inches (2-3.5 cm) in diameter. Seed head is similar to white clover, but more pinkish-white. Each raceme has 30-50 white or pale pink flowers that are 6-11 mm long. 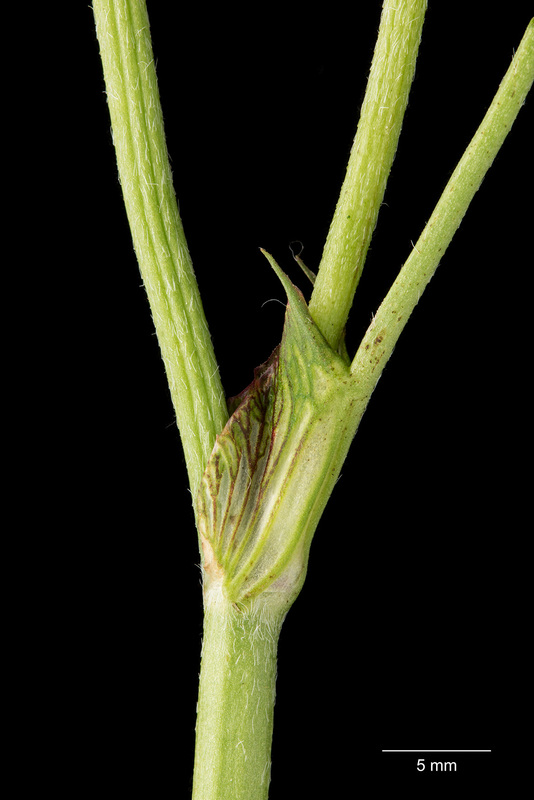 Flowers bend downwards after pollination and are brown at maturity. Palmately trifoliolate leaves with equal-length petiolules. 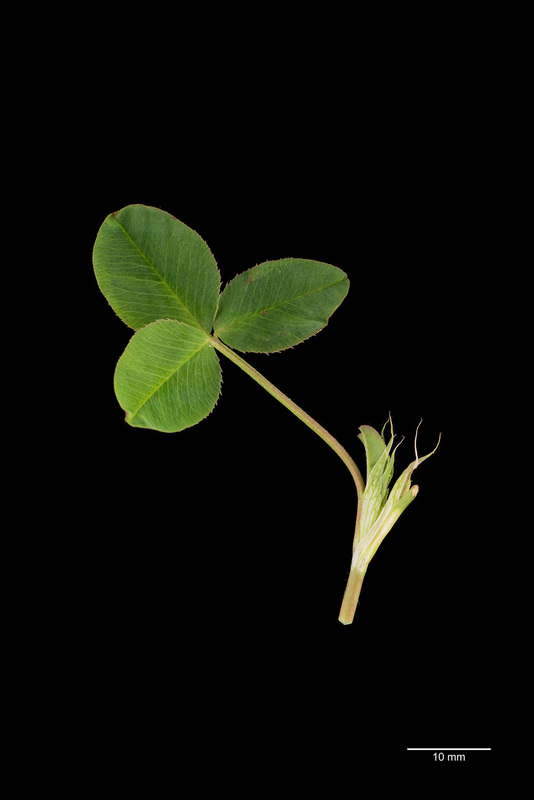 Can be distinguished from red clover by the absence of crescent-shaped marks on each leaflet, more conspicuously toothed leaflets, and prominent veins that appear to extend beyond the edge (margin). Stipules are continuously tapering, with greenish veins, and sharply pointed. Stems are indeterminant, semi-erect, glabrous (not hairy), long, thin, and hollow, usually reaching 1-3 feet (30-90 cm). Has a many-branched taproot that penetrates deep into the subsoil. Each seed pod is about 1 cm (0.4 inches) long and contains 3-5 seeds that vary in color from dull green to nearly black. 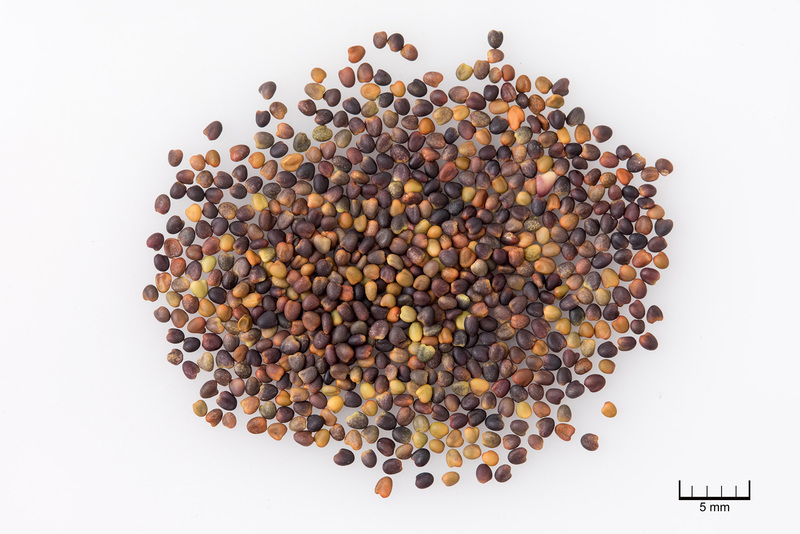 Seeds are small (1 mm long, 0.9-1.0 mm wide) with 700,000 seeds/lb (1,540,000 seeds/kg). They are heart-shaped, greenish-brown, with tinges of red, aging to a darker brown (less red than white clover seed). Alsike clover has a fine-stemmed, semi-erect, indeterminate growth habit. It has no stolons or rhizomes. It is a short-lived perennial. 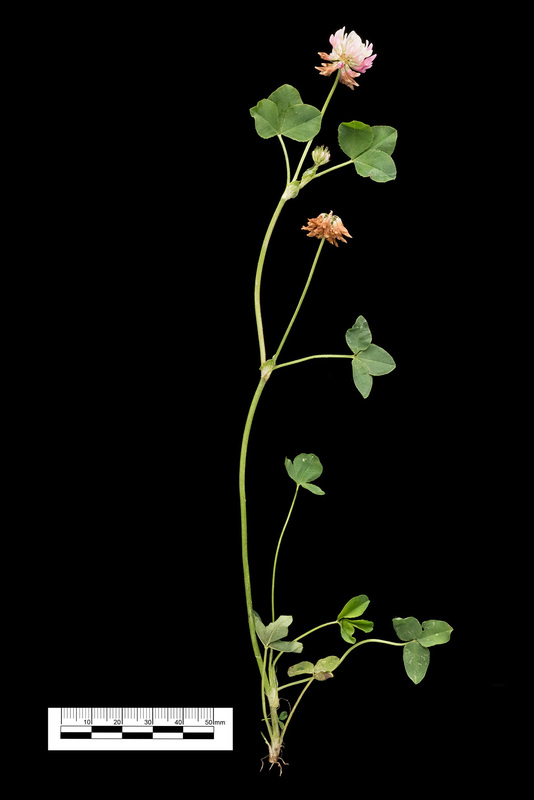 Alsike clover grows best in cool, humid climates, with spring growth beginning when temperatures are above 40 °F (5 °C); growth is severely reduced above 86 °F (30 °C). 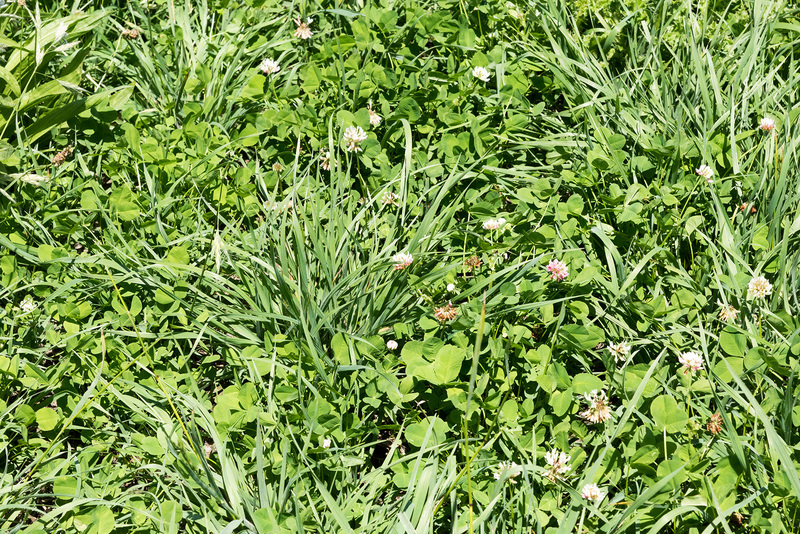 It has a medium yield potential, comparable to white clover and less than red clover. Mixed with grasses, yearly production on well-managed sites with adequate moisture will be 10,000-12,000 lbs dry matter per acre (~11,000-13,500 kg/ha). Seasonal production profile will show greatest production in late spring and autumn periods. 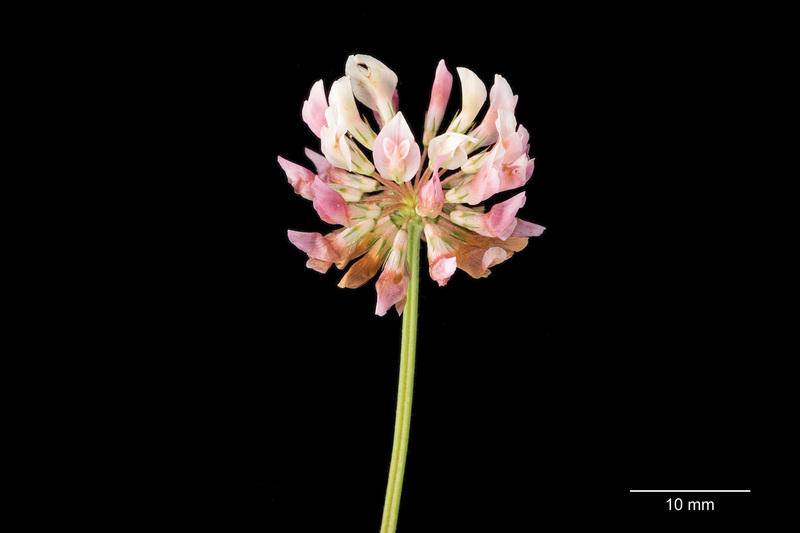 Once thought to be a hybrid of white and red clover (hence the Latin species name), alsike is a distinct species. Cultivars are either diploid or tetraploid. 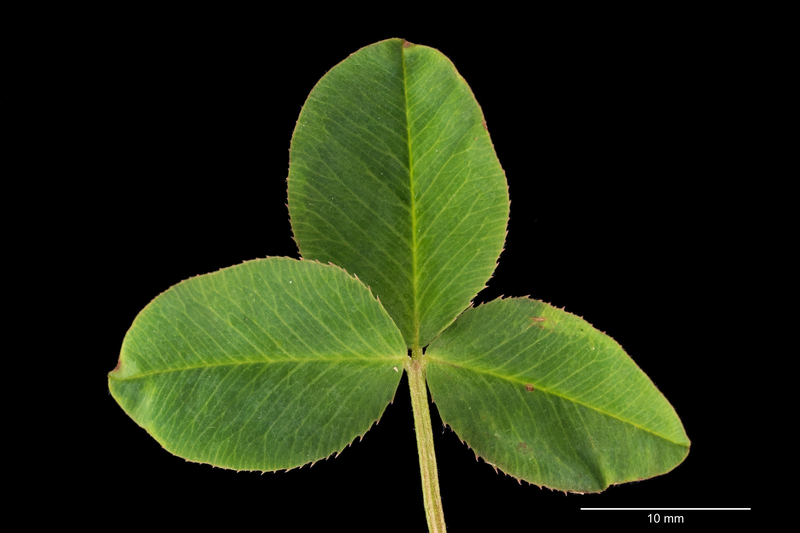 Common alsike clover is diploid. Tetraploids are taller, have larger leaves and flowers and are later maturing. ‘Tetra’ is a tetraploid cultivar developed in Sweden. Grown in the Pacific Northwest and the Great Lakes region of the upper Midwest. Important forage legume in areas suited to clover-timothy production. Requires 25-40 inches (635-1000 mm) of precipitation or irrigation. Low heat and drought tolerance; requires irrigation if soil moisture is low. Moderate winter hardiness and tolerates frost heaving. Wet, high clay content soils. Produces well in areas not suitable for red clover. Tolerates long spring flooding of 7-30 days. Tolerates strongly acid soil conditions (pH 5.1-7.3). Moderately sensitive to salinity (1.5-3 dS/m). *Low temperature: USDA Plant Hardiness Zones – based on average annual extreme minimum temperature: 3b-8b; annual in poorly drained soils in zones 6-7. Latitude suitability: 40-48’ N.
**Not drought or heat tolerant. Heat Zone – based on Mean Max July Temp: <= 31°C/88 °F. Rooting: branched taproot to 4 feet (130 cm). *** Soil pH: NRCS Range and Pasture Handbook, Chapter 3, Table 3-7; Classification for alsike clover classification is Tolerant of Strongly Acid Soils: 5.1-7.3. Classifications – tolerant of soils that are: (1) Very strongly acid to strongly alkaline, 4.5–9.0; (2) Very strongly acid, 4.5–7.3; (3) Strongly acid, 5.1–7.3; (4) Moderately acid, 5.6–7.3; (5) Moderately acid to moderately alkaline, 5.6–8.4; (6) Slightly acid to moderately alkaline, 6.1–8.4; (7) Near neutral, 6.1–7.3; (8) Alkaline, 6.7–9.0. † Soil drainage: NRCS Range and Pasture Handbook, Chapter 3, Table 3-4; Classification for alsike clover is Tolerant of PD to WD Soils. Percent Relative Yield for Arrowleaf Clover for the classes 1-7: 25, 50, 75, 100, 100, 55, 30. # Soil salinity: NRCS Range and Pasture Handbook, Chapter 3, Table 3- classification for alsike (and Berseem, white, red, strawberry) clover is Moderately Sensitive (1.5-3 DS/m). Classifications are: (1) Tolerant, 6–10 dS/m; (2) Moderately Tolerant, 3–6 dS/m; (3) Moderately Sensitive, 1.5–3 dS/m. Very palatable to cattle. Crude protein and digestibility decline with advancing maturity. Can cause bloat and photosensitization. Implicated in “alsike clover poisoning” in horses which leads to liver disease. Although the literature does not provide conclusive evidence of causality, do not include in seed mixes for horse pastures. Sheaffer, Craig C., M. Scott Wells, and Jerry Nelson. 2018. Legumes for Northern Areas. Chapter 8 In: Forages: An Introduction to Grassland Agriculture. Seventh Edition. John Wiley & Sons, Inc.
USDA NRCS Plant Guide. 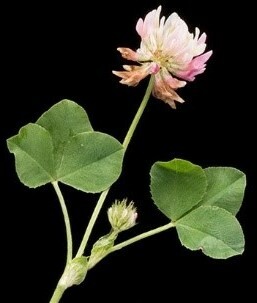 Alsike clover (Trifolium hybridum L.). https://plants.usda.gov/plantguide/pdf/pg_trhy.pdf.